Finding Personal Digital Content - Datamaton Inc.
Part 1: this post – Intro to the search problem and Advanced Search. Part 5: Integration with other tools & next steps. There are lots of search tools available today, but finding something by searching for it is still difficult for many reasons. There’s no “global” search. We still have to remember where we’ve stored something before we can search for it there. This problem is getting worse with the proliferation of free email and cloud storage accounts. We often have half a dozen possible places where that file or email could be – and we have to search each place one by one. Some content types are difficult to search. We can search documents based on their content or partial file names, but photos and videos are impossible to search this way. Social media posts, texts from messaging apps and files embedded inside ZIP files or emails are all examples of content that is hard to search. Some storage locations have very poor search tools. Messaging and social media apps make it very easy for us to generate thousands of messages, posts & comments. However, finding that one message or comment that has a phone number we want is a nightmare. Similarly, phones, tablets & calendar accounts don’t have good search tools. We cannot search using what we naturally remember. We remember different things about different content, and need a wide range of search options. We may want to search for a social media post based on who commented on it or liked it. An email may be easier to find based on one of the recipients’ name or whether it had a specific attachment. We may want to search for a photo or video based on the phone/camera used or an approximate range of dates when the picture was taken. The easiest way to find a document could be based on the properties of the email or ZIP file inside which it resides. Unfortunately, existing search tools don’t always let us search with what we remember. We’re forced to learn many different search tools/mechanisms. We have to use a local file manager to find files on our desktop but a browser based interface or a proprietary vendor app to search files on cloud storage accounts. Google Gmail allows us to assign multiple tags to an email, so we can search those emails using tags – but that’s not so with emails at other accounts. This is true for most cloud based accounts – each vendor supports vendor-specific search capabilities and mechanisms. Our content manager app Blob lets you find any type of content, stored anywhere, with whatever you naturally remember (FAQs). You can search all or a subset of storage locations in a single search. 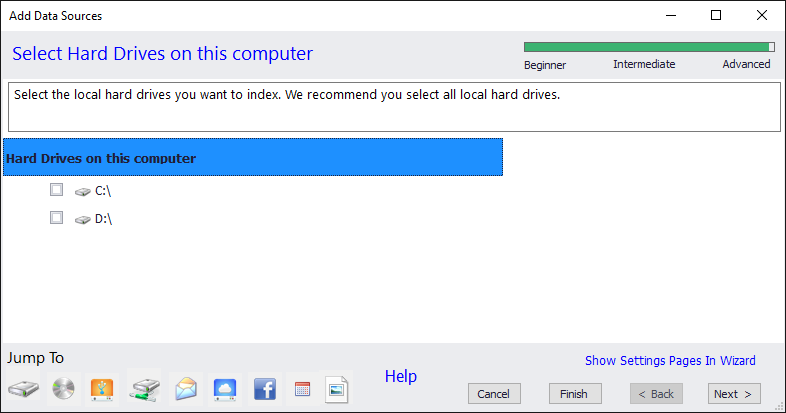 You can mix local hard drives, USB/network disks, CDs etc. together with cloud based email, calendar, social media or file storage accounts in a single search. You can search for all content types and storage locations that are otherwise not searchable (e.g. social media accounts or calendars). You can search based on whatever you remember. For example, you can find a Facebook post based on who liked it or an email based on the name of an attachment it contains (more details below). Blob is privacy friendly – it runs on your own computer and saves everything to your local drive only. You do not need to create an account with Datamaton and absolutely nothing about you or your content is ever sent to our servers. In the next section, I’ll give you more details about how you can use Blob’s advanced search capabilities. There are many ways Blob helps you find your content. In this post, I’ll only cover Blob’s “Advanced Search”. In subsequent posts, I’ll cover how it helps you quickly locate content within a specific storage location. Before Blob can search a storage location (called “Data Source”), it must index it. After you install Blob, you first tell it about all the storage locations where you have personal digital content. You do that by clicking on the “Add Data Source” button circled below. This will bring up the wizard that lets you add the storage locations you want Blob to index. The bottom left corner of the screen shows the different categories of storage locations – local hard drives; CDs/DVDs; USB & removable storage; network attached drives; email accounts; cloud file storage accounts; social media accounts; calendar accounts and web based photo storage accounts. Some Data Sources like calendar and social media accounts will likely be indexed within a few minutes – others like network attached drives and local hard disks might take a few hours to be fully indexed. Once Blob has indexed your storage locations, you can issue an advanced search by clicking on the search icon (magnifying glass) at the top right corner of the menu bar. 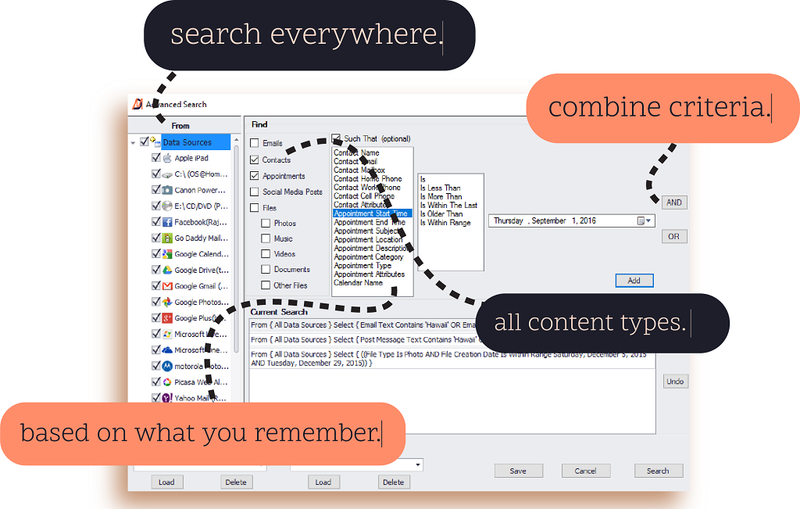 The advanced search screen that opens lets you chose the storage locations to search, content types to search and the content properties to search. From <selected storage locations> Find <selected content types> Such That <content property> <Contains….> <Value> . The left pane of the advanced search window lets you select the storage locations (and Virtual Folders, more on that later) to search. Blob supports a wide variety of storage locations, both local and remote (and more are being added). Local storage locations include your computer’s hard disks, USB and network drives, phones, CDs, DVDs and flash storage used in cameras, camcorders and music players. Remote storage locations include email accounts, cloud file storage accounts, social media accounts, web-based calendar accounts and cloud photo/video storage accounts. The “Find” column in the right-hand pane lets you select the type of content you want to search. Blob currently supports files, emails, social media posts/comments, appointments and contacts. It supports searching based on properties specific to photos, audio and video files. Blob natively supports compound files, so a search will automatically return content embedded inside ZIP files or emails. For all file types: You can search based on partial file or folder name, file type, file extension, creation date, last modification date, size and attributes. Blob lets you assign tags and comments to any file and then search based on these values. You can even search for embedded files based on the file/folder names of the parent (ZIP) file it is embedded inside. If the file is hosted on a cloud storage account (e.g. Google Drive) and has associated comments, Blob will let you search based on these comments too. For photo files: In addition to the common file properties listed above, you can search for an image file using its album name, title and camera make or model. If the photo file is hosted on a cloud photo storage account (e.g. Picasa Web Services) and has associated comments, you can search for the photo using these comments too. 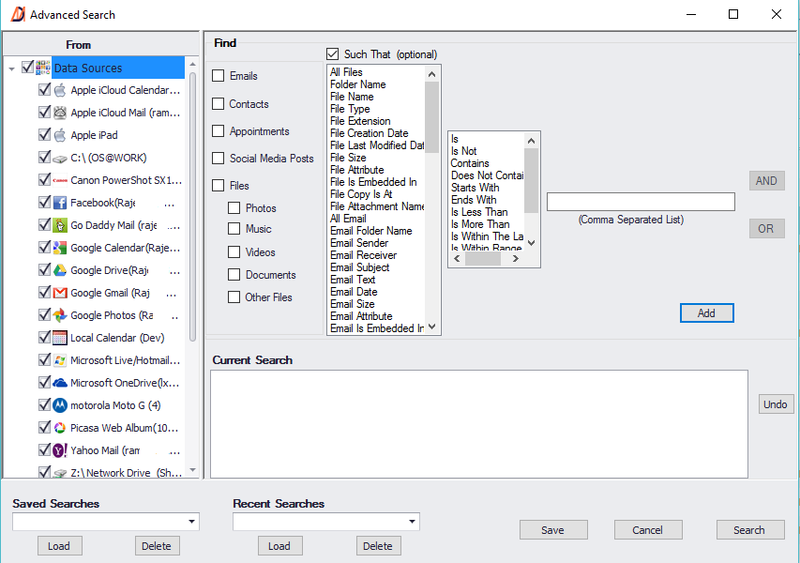 For audio and video files: In addition to the common file properties, you can search using the title, album, artist, genre, composer and media play duration. If the file has embedded information like lyrics, actors, director, producer, publisher, rating etc., you can search based on these attributes too (Blob will store these properties in the Comments property of the audio/video file). For document files: In addition to the common attributes, you can search documents based on their content (with some limitations). For emails: You can search using email partial folder name, email sender, recipients, subject, email message content, date, size, attributes (unread, replied, forwarded…) and attachment info. Blob lets you assign tags and comments to any email and then search based on these values. For social Media Posts: You can search for a social media post based on the partial poster’s, commenter’s or liker’s name, the targeted recipient’s name, post type or category, message text, post creation date, last modification date (last time someone commented or liked it), number of likes or comments and the place associated with the post. You can assign tags to any social media post and search based on these values. For calendar appointments: You can search for a calendar appointment based on its start or end time, subject, location, description, category or type and the partial name of the calendar within which it resides. For contacts: You can find a specific contact from the contact’s partial name, email address, attributes and partial home, work or cell phone number. Text properties: This includes any content property that takes a text value. Examples include file or folder name, email sender or receiver’s name or address, social media poster, commenter or liker’s name etc. You can search whether a text attributes Contains, Does Not Contain, Starts With, Ends With, Is or Is Not a given value. For example, a search “File Name Contains fin” will return all files that contain the text “fin”. This includes files whose names are “finance”, “financial”, “muffin” etc. (searches are not case sensitive). Date properties: Any content property that takes a date value falls in this category. Examples include the creation or last modification date for a file, email or social media post. You can search whether the date attribute Is, Is Less Than, Is More Than, Is Within The Last <n> minutes/hours/ days/weeks/months/years, Is Older Than a given date or Is Within Range of a start and end date you specify. For example, the search “Find Documents whose Last Modification Date Is Within the Last 3 weeks” will return all documents that were modified within the last 3 weeks from when the search is issued (including matching documents that are email attachments). Size properties: You can search for files or emails whose size Is, Is Less Than, Is More Than, or Is Within Range of the start and end sizes you specify. The size value can be specified in bytes, kilobytes, megabytes or gigabytes. Blob supports compound content natively. Whenever you issue a search, the results will automatically include matching files that are embedded inside other (ZIP) files or inside emails as attachments. You can find more information about Blob’s search capabilities in the Frequently Asked Questions. As you can see, search is a huge focus area for us and Blob’s Advanced Search goes a long way in finding personal digital content. However, this isn’t the only way Blob helps you find your content. In the next few posts, I’ll write about more ways in which the app helps you quickly find what you are looking for, either within a specific storage location or across all of them.